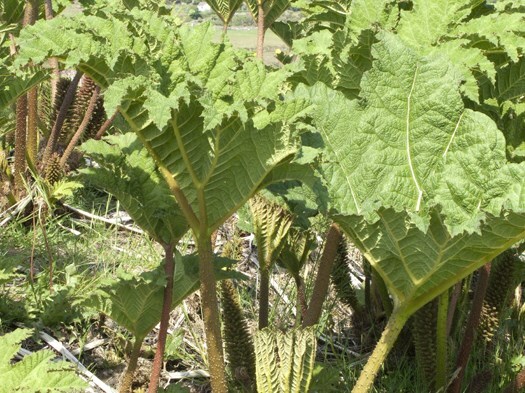 Gunnera tinctoria (Chilean gunnera) is a perennial herb/ (family Gunneraceae) with clusters of purple flowers and large prickly leaves found in the central coast ranges of California. Chilean gunnera has both female and male flower parts. It is native to Chile. It occurs in grasslands, wetlands, bogs and woodlands. It spreads via seeds and rhizomes. Its seeds are dispersed by birds and water. Plant Risk Assessment - An evaluation of the potential for a plant to be invasive in California. No Weed RIC Management Notes are available for this species. Check for information on other species in the genus on the Weed RIC site. There are no Symposium presentations associated with this species yet.